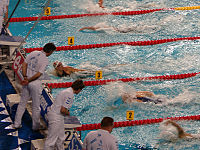 The 2008 LEN European Aquatics Championships were held in Eindhoven, Netherlands, from 13–24 March 2008. They were the European championships for swimming (50 m), diving and synchronised swimming for 2008. Two new events were contested: the 800 m freestyle men and the 1500 m freestyle women. This is the first time that the men's and women's swimming programs are identical. Wikimedia Commons has media related to 2008 LEN European Championships.